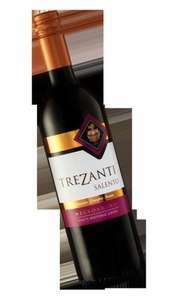 Trezanti Rosso 750ml, Buy 6 bottles like last deal I posted to get £10 off - code CATA052 or CATA053. A deep beauty full of red cherry flavours with a hint of coffee, chocolate and spice. Made with the Negroamaro grape from the south of Italy, this red is famed for its deep, dark colour. It's great on its own or with meaty pasta dishes. This is the only red wine I really like so could not believe it was reduced to £5.29 and the £10 off code worked too !!! £3.63 (£21.74 for 6) for a great red !!! A bit excited over this one, though just ordered a box last week when ordered the pink fizz so a bit gutted it has been reduced now, though nothing for it than ordering another box canny pass the fab deal will just have to work a bit extra to pay for them though much cheaper than a night out !! CATA054 also works to take £10 off 6 bottles ! Got email to say already desatched only ordered this afternoon !! Codes still working though don't think this deal will last much longer as it is the cheapest it has ever ever Been ! !